Just off the plane during a visit to Fort Lauderdale, a good friend, Tom Schon, took me to Hardy Park Bistro, a very nice little bistro near downtown. It’s located next to an open air Crossfit Gym and across the street from Hardy Park, one of the oldest in Fort Lauderdale. There is inside and outside seating – we chose an outdoor table. This gem is definitely off the tourist track, and it is one of those places that is worth looking for. The menu is short, fitting a small space, and there are a few specials. Tom had a Caesar Salad (he had been noshing and drinking Champagne earlier). I had the Caesar – very light and refreshing – very fresh ingredients, no anchovies, which I would have liked, but a hard-boiled egg with some treatment on the yolk, which added a nice touch; and a house burger, the H.P.B. 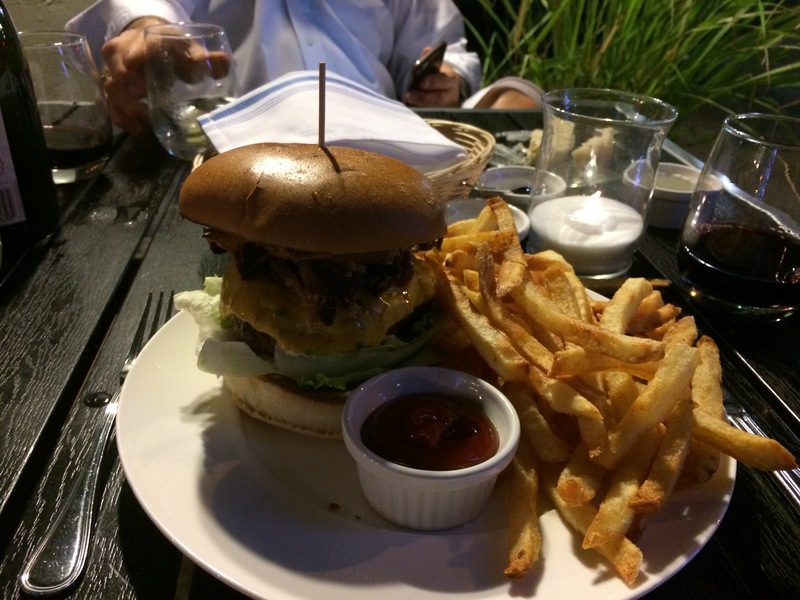 – a statuesque beauty with Cheddar, Crisp Onion, Tomato Chutney and French Fries. The burger was excellent and the French fries were perfect, something I rarely say about restaurant fries. They were served with home-made catsup. Very nice. The H.P.B. Burger and fries. The Shiraz is nearby. The wine list at Hardy Park Bistro is short but very well selected. Most are available by the glass, and they mix California wines with selections from Australia and France. 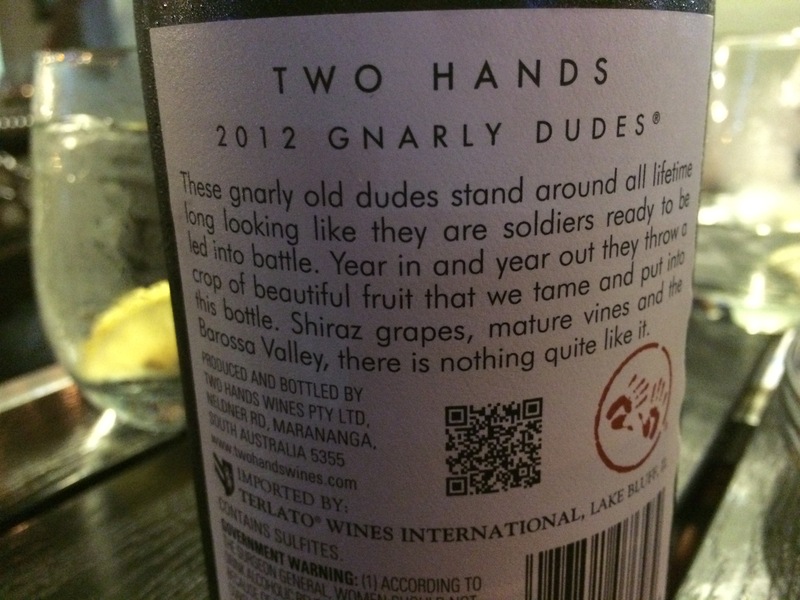 I selected a 2012 Two Hands Gnarly Dudes Barossa Valley Shiraz. The Shiraz of the Evening. The wine was a perfect match for the burger. It has a spicy nose and a nice mixture of fruit (berries, cherry) and spice in the mouth. Very smooth, nice mouthfeel, and a pleasant finish. This wine, it seems, was made for burgers. 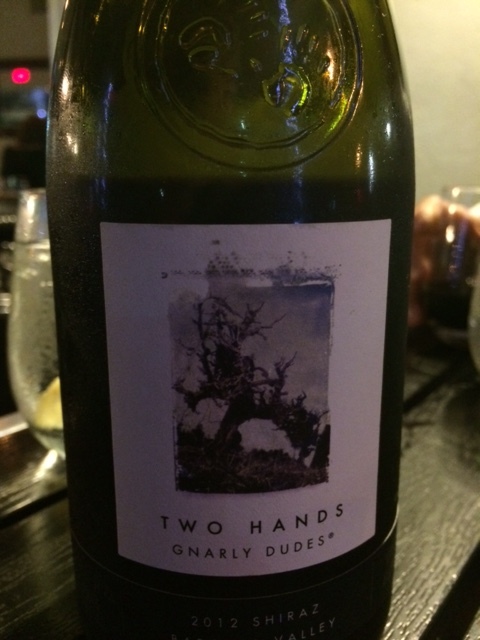 It is modestly priced (the Bistro seems to have a low markup, although I was not familiar with all of the wines). The back label of The Shiraz. I really would like to see Hardy Park Bistro succeed. Ft. Lauderdale is a tough restaurant market, but this is a worth, if off the beaten path, entry. The also do a nice brunch. Our dinner check, with two salads, the burger and fries, and the bottle of wine was under $80 with tax.